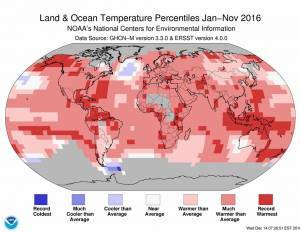 December 21, 2016 – The year 2016 remains on track to be the hottest year on record, with average global temperatures set to break even the records of 2015, according to data covering the first eleven months of the year. Long-term indicators of human-caused climate change, including record carbon dioxide concentrations, and glacier melt, and low sea ice, continued. The World Meteorological Organization will issue consolidated figures on 2016 global temperatures in early 2017. November data confirms WMO’s assessment issued in November that 2016 will very likely be the hottest since records began in the mid 1880s. The WMO provisional statement on the climate in 2016, released for the UN Climate Change conference in Marrakech, Morocco, cited preliminary data (to the end of September) that 2016’s global temperatures are approximately 1.2° Celsius above pre-industrial levels. All the hottest years on record apart from 1998 (which had a strong El Niño) have been this century. 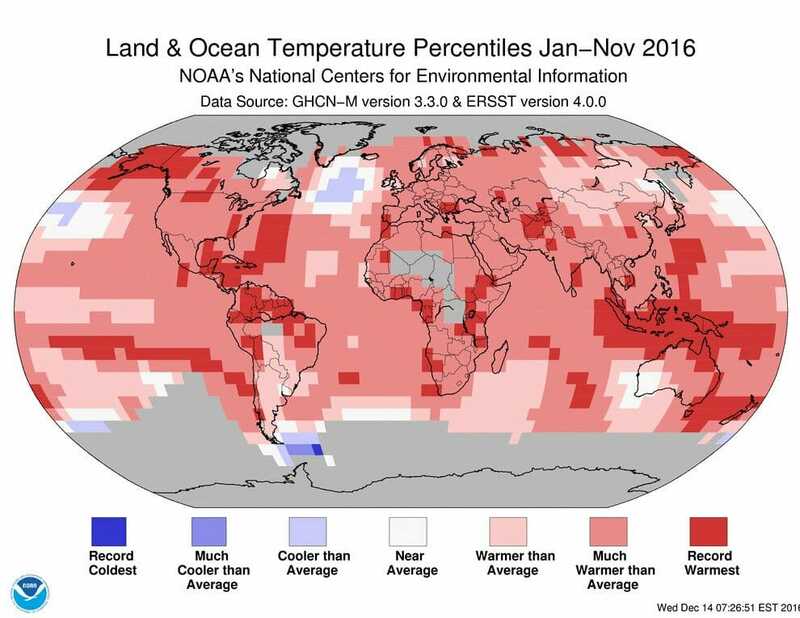 “The climate has broken records in 2016” said WMO Secretary-General Petteri Taalas. “In the atmosphere, carbon dioxide levels were above the symbolic 400 parts per million. In the oceans, record warmth contributed to widespread coral reef bleaching. And on land, droughts, floods and tropical cyclones disrupted the lives of millions of people as well as progress towards socio-economic development. A part of these disasters may be linked to climate change” said Mr Taalas. “Temperatures in the Arctic have been particularly high,” said Mr Taalas. 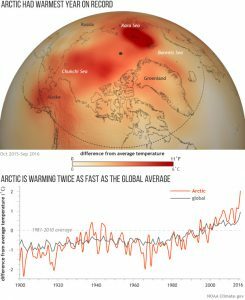 “Arctic sea ice was exceptionally low, especially during early 2016 and the October-December re-freezing period. Antarctic ice extent was also the lowest on record in November, in contrast to the trend of recent years. What happens at the Poles does not stay at the Poles but impacts weather patterns on a hemispheric scale,” said Mr Taalas. The Arctic is warming at about twice the rate as the global average. The Arctic Report card, issued by NOAA and partners, highlighted that the persistent warming trend and loss of sea ice are triggering extensive Arctic changes. “Scientific studies are increasingly proving the link between extreme weather – especially heat – and human-induced climate change from greenhouse gases,” said Mr Taalas. The most recent study, released by the Bulletin of the American Meteorological Society (BAMS) on 15 December, said that numerous weather events in 2015 were made more likely by climate change. The strongest evidence for a human influence was found for temperature-related events — the increased intensity of heat waves around the world, record-low Arctic sea ice extent in March and the extraordinary extent and duration of Alaska wildfires. WMO will issue final details about the 2016 state of the climate in early 2017. It will take the pre-industrial era as a baseline, and use three datasets from NOAA, NASA and the Hadley Centre of the UK’s Met Office and Climatic Research Unit, University of East Anglia. WMO also draws on reanalysis data from the European Centre for Medium Range Weather Forecasts, which has used all available observational data and an assimilation system to produce a global climatology. With only one month left in the year, the 2016 year-to-date global temperature (January–November) was the highest on record for this period, at 0.94°C (1.69°F) above the 20th century average of 14.0°C (57.2°F), according to NOAA. Record warmth for the year-to-date was present across Alaska, much of western Canada, parts of the northern and eastern United States, much of Central America and northern South America, various regions across Africa, parts of northern and southern Asia, much of southeast Asia island nations, according to NOAA. The average global sea surface temperature for the year-to-date was the highest in the 137-year record. Record high average sea surface temperatures for the January–November period were present across the northern Pacific waters near Alaska, the Bering Sea, parts of the southern and western Pacific, a long swath of the western Atlantic stretching to the Gulf of Mexico, parts of the southern and eastern Indian Ocean extending across the waters of the southeastern Asia island nations and Oceania. The only ocean area with record cold temperatures was east of the Drake Passage near the Antarctic Peninsula, according to NOAA. Copernicus Climate Change Service (ECMWF) said November 2016 “extended the spell of exceptional global warmth that has now lasted more than a year.” A separate analysis, from the WMO Regional Climate Center – Network for Europe (WMO Regional Association VI), said that Europe would likely have its fourth warmest year on record.